• More families are living with more than one generation of adults under one roof. • Everyone in the house needs space and privacy. • Sometimes you have to be creative to carve out private space. • As always, the home’s location is important. • Involve everyone in the discussion, including siblings who won’t live in the house. • Open the discussion somewhere other than your home. “A neutral location helps level the hierarchy of the family. The (arrangement) ends up being an exchange of services and assets among adults. It’s not a parent-kid thing,” Graham says. • Include nonresident adults in the discussion. “Siblings get uptight when it looks like one is getting some advantage in a current living or potential inheritance situation. Once you start mixing assets and families, you’d better get everybody involved or there will be a lot of calls to attorneys,” Graham says. • Treat your parents or children like adults. “Try to get away from the paternalism,” Graham suggests. • Consider a new home. 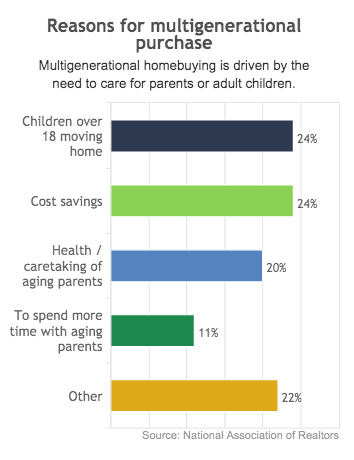 Some homebuilders have accommodated the multigenerational housing trend by including a so-called accessory apartment with a new house, Graham says. The apartment is intended to house a relative with a separate entrance and separate kitchen and living space. Older homes are less likely to have this layout. • Get everyone’s ideas on the table. “You might have conflicts while you’re discussing and deciding things, but as long as it’s a family decision, you won’t have as many family explosions or meltdowns later on,” Graham says. 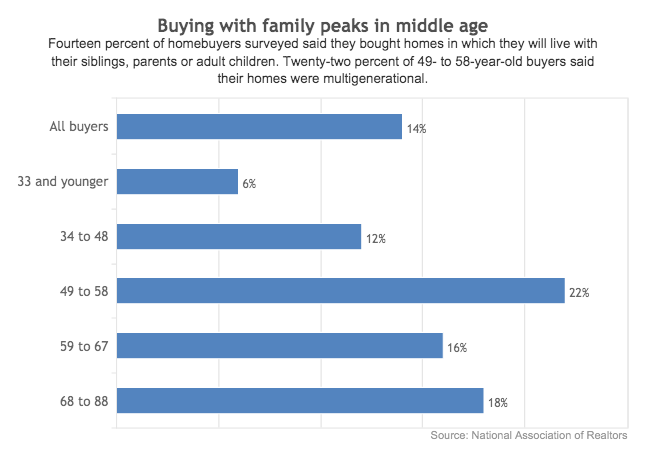 Buying a home with an elderly parent or other family member often presents unique and challenging factors. Weighing your options, calculating costs, involving the extended family, finding the right home – all of these issues and more can be negotiated with the right professional advice. If this is a move you are considering, I’d like to offer my experience and resources as a way of helping you reach an informed decision. Please contact me for a no-obligation consultation. Let’s discuss the opportunities and challenges. Together, we can help you move forward confidently. Call me today!